Should Government Reduce Petrol Costs? HomePolicyShould Government Reduce Petrol Costs? In the last 16 years, 4 out of the highest 5 prices for petrol were reached in May 2018. This is the highest since September 2013, when the price of crude oil in the international market was $109 per barrel. Now it is $40 per barrel. Price of diesel now, on the other hand, is the highest in this period. This is due to government hiking excise duty on petrol and diesel by 400% and 133% respectively on their November 2014 rates, increasing taxes levied from Rs.9.2 to 21.48 for petrol and from Rs.3.43 to Rs. 17.33 for diesel. Crude prices in the international market fell off a cliff, dropping by over 70% since their 2013 high. 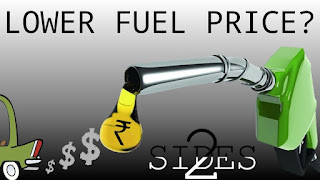 But despite this fall of oil, fuel prices in India have remained largely constant, or have increased, thanks to the current central government's fiscal policies. In fact, more than 50% of the price of petrol, and 40% of the price of diesel, is tax. According to the Indian Oil Corporation, petrol, sold at well over Rs.70 at pumps, costs only a little more than Rs.27 at the refineries. The rest is tax and commission. Taxes vary from state to state, but are largely made of excise duty of around Rs.22 and VAT of Rs. 15. The central government can at any time reduce the taxes and pass on benefits of lower international prices to the common citizen, but has refused to do so in order to shore up its own tax kitty. And it is not like there are not enough incentives to reduce fuel prices. Lower prices will immediately lead to a lower rate of inflation in the economy, reducing the cost of borrowing. Reducing prices would be equivalent to giving more money into the hands of the common man, without the hassle of actual distribution, i.e, it is an easy and efficient way of wealth distribution. This will lead to higher sales across the market spectrum, and higher customer sentiment and spending power. Furthermore, using high fuel tax as a means to cover the fiscal deficit is nothing but lazy policy. Especially for our country, the largest importer of oil in the world (buying around 80% of its need), any upward trends in global oil prices would be felt very harshly. In such a situation, cutting the tax would be the only path for the government, but it if it relies on oil tax as much as it does now, such a necessary downward revision would spell financial catastrophe. It is an alarming fact that a gallon of petrol(~3.78 Litres) currently costs more than 73% of the daily income for an average Indian. This implies a drastically reduced spending capability for an Indian consumer as opposed to his global peers. The per capita fuel cost is, in fact, the highest among all the major economies of the world, including Pakistan which has its fuel cost as 60% of income. This high cost in terms of affordability is definitely not good news and is a glaring example of the failure of the current government's policies. 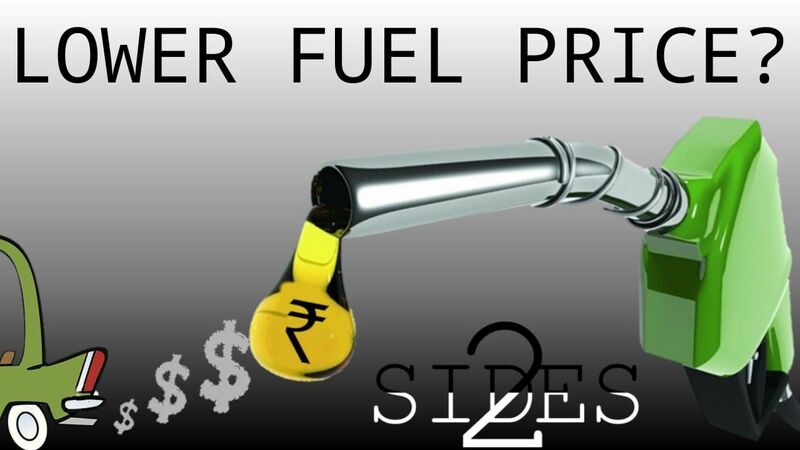 Fuel is a major source of income for any government, and it has been and is so across the globe. In India, oil products account for a lion's share of excise revenue, at 56% of the total, far more than the distant second of tobacco products at 9%. For a government to be able to spend on infrastructure and schemes which benefit the masses, such a source of income is indispensable. If the government were to forego petrol and other such fuel tax, the shortfall will have to be compensated by market borrowing. This will in turn increase rate of interest for everyone. Further, studies have shown that increase in the price of oil products is much less likely to cause an increase in the price of other products and consequently inflation. The money collected from tax is given back to the people indirectly as subsidies, tax benefits and other such giveaways. Other welfare activities, such as road construction, irrigation, drinking water etc are all funded from the fuel tax money. Various road and highway construction projects also rely on this money. Finance minister Arun Jaitley in the Rajya Sabha has said, justly, that those who drive vehicles on roads must also pay for it. Further, of the excise duty collected, a large part goes to the state as VAT, accounting for 42% of the duty. A part of the money also goes back to oil companies due to losses they suffer when fuel prices vary. For instance, when international purchases are made against future purchases, a fall in price would lead to huge loss to the company. At one stage, the loss of the oil companies was as high as Rs 40,000 crore. The recent upward trend in fuel prices has been due to rise in the price of crude oil in the international market in recent months. The oil companies are free to fix petrol prices daily as per market forces since 2017, and there is little the government can do to interfere in their workings. Further, the most important justification for keeping fuel tax high is to reduce consumption. Indian cities are already among the most polluted in the world, and a high price of fuel is a means to reign in that vehicular and such pollution by the burning of fossil fuels. Tax is ultimately a form of implementation of policy, and thus keeping fuel prices high is a green initiative to curb the harm to our environment. The author would like to thank Ganesh S for suggesting the topic and to Goutham Krishna BS for layout suggestions.